The Project 12418 Class missile corvettes are designed by JSC Almaz Central Marine Design Bureau. Image courtesy of vpk.name. 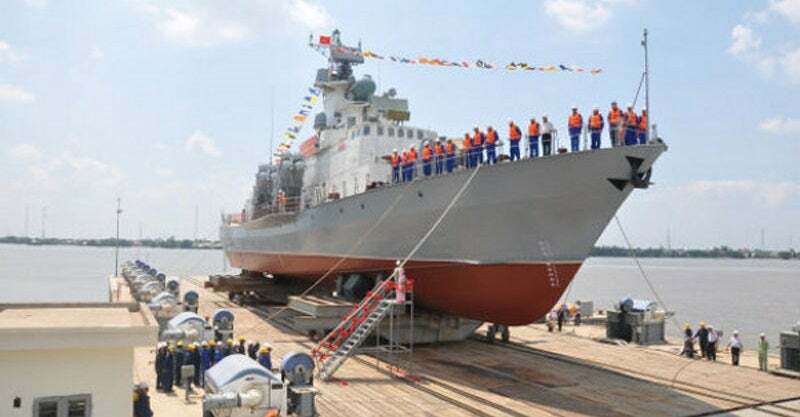 A series of ten missile corvettes are being built by Ba Son Shipyard under the licence of Vympel Shipyard. Image courtesy of Eternal Dragon at Vietnamese Wikipedia. The first licence-built boat was launched at the Ba Son Shipyard in March 2013. Image courtesy of Eternal Dragon at Vietnamese Wikipedia. The Project 12418 Class missile boats are armed with 16 Uran-E anti-ship missile systems. Image courtesy of Vitaly V. Kuzmin. A series of ten Project 12418 missile boats are being licence-built at the Ba Son Shipyard for the Vietnamese Navy. The Project 12418 Molniya / Tarantul V missile corvettes are designed by JSC Almaz Central Marine Design Bureau, based in St. Petersburg, Russia, and manufactured by Russian shipbuilding company Vympel Shipyard JSC. "The Vietnamese Navy took delivery of two boats (HQ-375 and HQ-376) in 2007 and 2008, respectively." Primary missions of the Project 12418 Class are destruction of enemy combat vessels, landing craft and enemy naval forces in both littoral waters and open seas. Other missions include patrolling, rescue, anti-piracy, border protection and reconnaissance. Vietnam signed a contract with Russia in March 2004 to provide design and technical supervision for the construction of ten Project 12418 missile boats in Vietnam, under the licence of Vympel Shipyard. The contract also included delivery of two Vympel-built, modernised missile craft. The Vietnamese Navy took delivery of two boats (HQ-375 and HQ-376) in 2007 and 2008, respectively. The first (HQ-377) of ten licence-built boats was laid in 2010 and was launched in March 2013. The launch of second boat (HQ-378) took place in April in the same year. Sea trails of both the corvettes were conducted in October 2013 and the deliveries were made in July 2014. The third (HQ-379) and fourth (HQ-380) boats were inducted into the Vietnamese Navy in September 2015. The fifth and sixth corvettes in the series were launched in April 2016. The main hull of the Project 12418 Class missile corvette is made of steel and the superstructure is built using aluminium materials. The corvettes have an overall length of 56.9m, an overall beam of 13m, a full load draught of 3.62m and depth amidships of 5.31m. With a displacement of 510t, the boats can accommodate up to 44 crew members. The wheelhouse, located amidships, houses sensor suite and steering consoles. The missile corvette is armed with one 76mm AK-176M gun mount at the front and two 30mm AK-630M gun mounts at the rear for protection against sea-based and aerial threats. A total of 12 9K38 Igla man-portable air defence systems (MANPADS) can be carried to provide increased protection for the crew from enemy attack aircraft, cruise missiles and unmanned aerial vehicles. The vessels also feature 16 Uran-E (Kh-35) shipborne missile systems in launch containers on both sides to engage a variety of sea-based targets. The Project 12418 Class is equipped with a wide range of navigation and communications systems for safe and efficient operation at sea. The navigation systems include KM69-M2 magnetic compass, Pirs-2 and RE receiver, AP-5 autoplotter, NEL-M3B echo sounder, IEL-1 log, ADK-5 (SCh-1) satellite navigation suite, GAGK-1 gyro azimuth horizon compass, and RN radio direction finder. Communications systems aboard the Project 12418 Class include Buran-6E communication suite, visual communication and surveillance devices, internal communications systems, and other GMDSS communication systems. Target acquisition and tracking is provided by the onboard radars located on the roof of the bridge. They include МR-123-02 radar, Liman navigation radar, Monument-E radar suite, Positiv-E radar, МP-407-E-EW system, and Podzagolovok-24E suite. Powered by two М15E.1 gas turbine units, generating a total output power of 32,000hp, the Project 12418 Class can sail at top speeds of 40k and reach up to a range of 2,300nm. The engines are developed by Gas Turbine Research and Production Complex Zorya-Mashproekt. The corvettes have a cruising speed of 12k and endurance of ten days. Dspnor is a radar signal processing and distribution technology provider located in Bergen, Norway.